Each year around Thanksgiving, the United board, relying on information from a team of data analysts, calculates a production target for the coming year. That target is always set below the national potato acreage in 2004. This year, United gave each of its members a quota that was 15 percent below his 2004 "base acreage." Buzz Shahan says that growers pay anywhere from $2,400 to $80,000 - an average of about $10 an acre - to fund United and the confederated member chapters. He concedes that it's counterintuitive for a farmer to pay that much money to an organization whose purpose is to prevent him from growing as many potatoes as he wants. But, as Shahan says one grower recently told him, " 'I'd spend $50 an acre to make $500 an acre any day.' It's a very interesting psychological gymnastic performance to watch." United's tactics for finessing supply were initially fairly crude: In 2005, the Idaho chapter took about 4 million hundredweight of already-harvested potatoes and plowed them back under. Last winter, by contrast, Idaho growers dealt with an oversupply of seed potatoes by turning them into potato flakes, which are used in products like instant mashed potatoes. United has also worked to realign some of the internal dynamics of the potato world. Until recently, farmers who grow "processing" potatoes for chips or frozen french fries and hash browns would be required to deliver a certain tonnage to the processor. To ensure that they'd have enough potatoes to meet the tonnage requirements if their crop partially failed, farmers would often grow up to 20 percent more than they'd need. If the crop didn't fail, however, they would wind up with far more potatoes than they could sell under contract - which they would then dump on the open market. 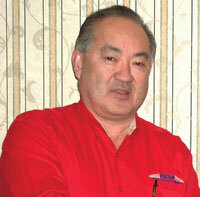 United helped convince processors to switch to acreage-based contracts, instead. United uses satellite imagery to ensure that its members comply with the quota; it also checks farmers' acreage against the paperwork they submit to the federal Farm Service Agency for government-support programs. United's bylaws allow it to levy fines of $100 per acre against growers who violate the quota, though Shahan and Wada say such fines are infrequently used. United also helps coordinate transfers of quotas between the various potato-growing regions to regulate overall supply. This year, for instance, growers in Wisconsin ponied up an extra $50 an acre so they could grow more than the target recommended by United. United then used that money to "buy down" additional acreage in Idaho, effectively transferring part of Idaho's market share to Wisconsin. And even after it sets a yearly target in the fall, United is constantly working on "flow control." The group uses a precise tally of how many bags of potatoes shoppers carry home from the grocery-store checkout stand - data gathered by Nielsen, the company better known for its TV ratings work - to establish a week-to-week demand curve for potatoes; then United slots the harvest into the market to match demand. 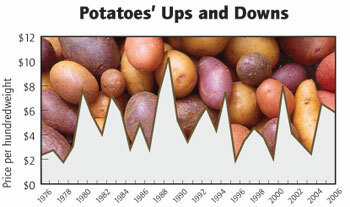 The effort seems to be paying off: After the $2.42 dumps of 2004, growers in Idaho have received more than $6 a hundredweight the past two years, according to Bruce Huffaker of North American Potato Market News. If prices stay up this year, it will be the third year in a row of decent prices - something growers haven't seen in decades. Returns still aren't as high as 2001, when Idaho growers got about $8 per hundredweight, or 1989, when they got $10, but long-term consistency may be more important than awesome prices. "Everybody likes the upside peaks, but you don't get them without the downside," says Tim O'Connor, the president and CEO of the U.S. Potato Board. "United has tried to level those peaks and valleys. It's like going up to bat and saying, 'I'll just take a single every time,' versus swinging for the fences and striking out nine times out of 10." And while United's track record is short, it has attracted notice from bankers like Jack Hetherington who make loans to potato farmers. If United is successful, he says, "we've got a reasonably good chance of having potato prices above the cost of production, and that is a very comforting feeling as a banker." Hetherington, who retired this summer and now serves as an advisor to United, says bankers have an incentive to encourage growers to follow the group's target recommendations even if they're not members: Each grower who plants more than his portion of the quota has the potential to drag down profits for all the growers the bank loans to. But there are some variables that not even a cartel can control. Good growing conditions that produce top-notch yields could cancel out the effect of United's recommended acreage reductions. And United is still battling its farmers' inborn drive to produce ever more. "Growers know their fields very well," says Shahan, and even as they reduce potato acreage to meet United's quota, they are abandoning their least-productive fields and shifting their potatoes to higher-yielding land. Albert Wada has another fear: United's success could encourage its own failure. "The growers, now that they've come back from the brink of disaster and are enjoying a little bit of profitability, aren't quite as motivated to do the cooperative march as they were two or three years ago," he says. "That's the challenge - that they'll back away from the cooperative model when economic times allow their independent nature to start to surface again." The author is a contributing editor of High Country News.